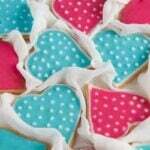 Simple and delicious butter cookies with a pretty flood icing, the perfect sweet gift for your Valentine. I like baking cookies or biscuits or Plätzchen, the way we call them in Germany. 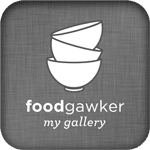 You will find many recipes on Where Is My Spoon, some of my favorites being the Easy and Crispy Ginger Cookies with Candied Ginger, the Vanilla Crescents with Hazelnuts – Austrian Vanillekipferl or the Chewy German Hazelnut Macaroons – Nussmakronen. To make the butter cookies couldn’t be any easier, making cookie dough is generally a very quick and easy matter and this particular recipe is really fool-proof. The only thing you will need is a heart cutter, but that should not be very hard to find. You will notice in the recipe that I only use ½ an egg. I know it is strange, but this is my recipe for regular butter cookies and it makes lots and lots of cookies. I really did not want to make so many of them, so I halved the recipe. To be able to use only half an egg, I beat the egg really well in a small cup and only gave half of it to the dough. However, you can make the whole batch, using a whole egg, keep in mind that the whole recipes makes over 40 cookies or so. It was the first time I have made a proper flood icing. I have tried it before, but never really followed a particular recipe, I have just mixed icing sugar with lemon juice and hoped for the best. I would just add more sugar or more lemon juice, until I got a more or less proper consistency for icing the cookies. This time I took the time to look for a recipe and the effort was well worth it. No more messing around with sugar, the quantities required by the recipe were just perfect and everything went very smoothly. The source for the flood icing is BBC Good Food, this is the recipe of one the contenders from The Great British Bake Off. I don’t know if he won the show, but he definitely won me with this perfect flood icing. If you follow the link, you will see step-by-step pictures of the decorating technique. Preheat the fan/ convection oven to 180 degrees Celsius/ 360 degrees Fahrenheit. Line two baking trays with baking paper. Mix together the sugar, vanilla sugar, corn starch and flour. Chop the butter into small pieces and give it to the mixture. Give an egg into a small cup, beat it very well with a fork and only give half of this liquid egg to the mixture. Discard the rest of the egg. Knead the dough with the hand held mixer. Give the dough onto the working surface and knead shortly with your hands until the dough is nice and smooth. 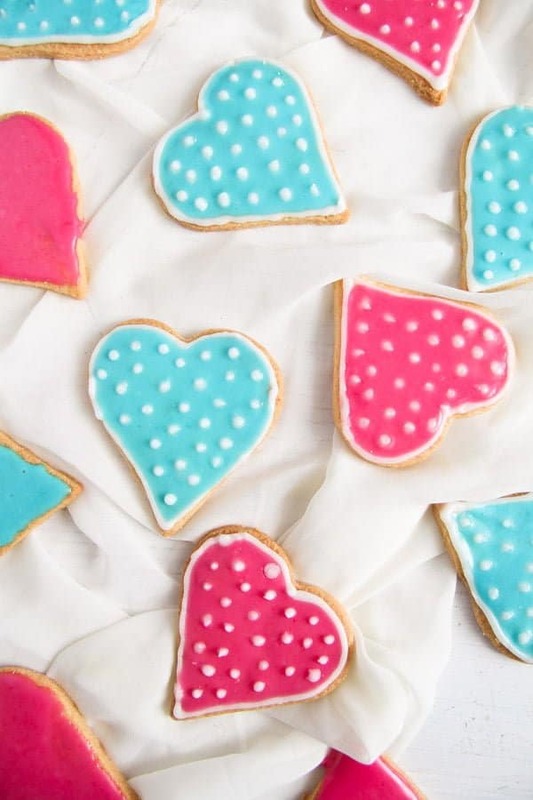 Roll the dough on the lightly floured working surface and cut out the cookies with a heart cutter. I have several sizes of heart cutters, I used the largest one. Knead the dough scraps again, roll them and cut out more cookies. Continue in this manner until all the dough is used. 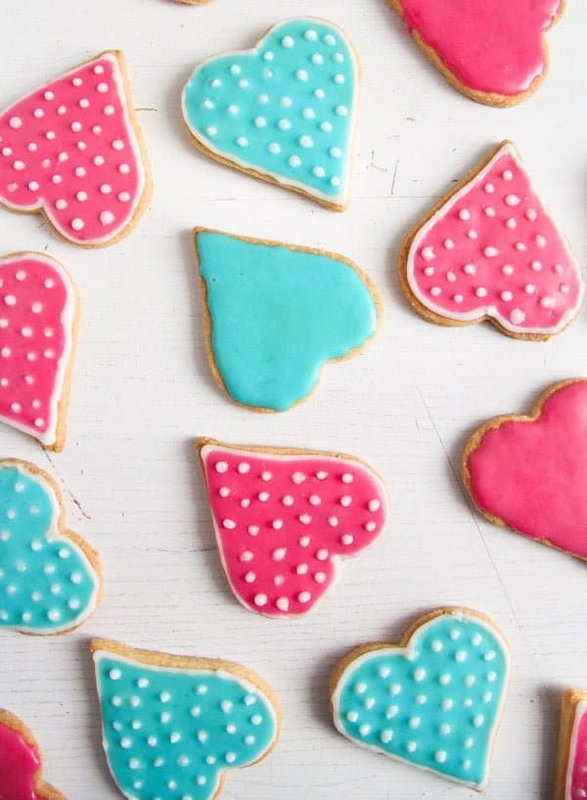 I had 24 large heart-shaped cookies, but you could have more if you use a smaller cutter. Place the cookies on the prepared baking tray and bake for about 12 minutes or until lightly golden. 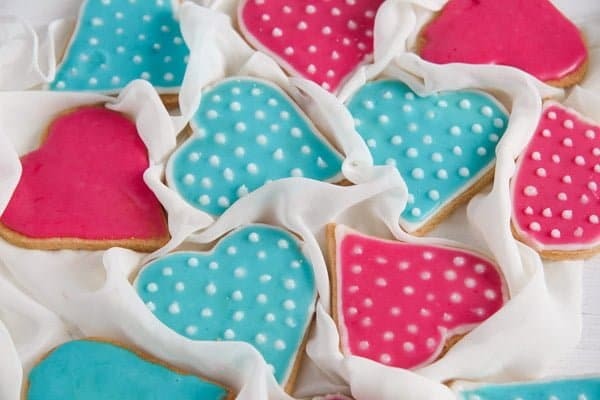 Keep an eye on them, the baking time depends on the size of the cookies as well, smaller hearts will need a shorter baking time. Let cool for about 5 minutes on the trays, then transfer the cookies to wire racks to cool completely. Only add the icing when completely cold. Mix the icing sugar with 3 ½ tablespoons lemon juice until smooth, thick and glossy. Take about a quarter of this mixture and give it to a piping bag fitted with a very small round tip. Set the piping bag aside. Add another ½ tablespoon lemon juice to the remaining icing in the bowl. Add only a few drops lemon juice more if necessary, the mixture should be pourable, but not thin. Mix well and divide the icing between two small bowls. 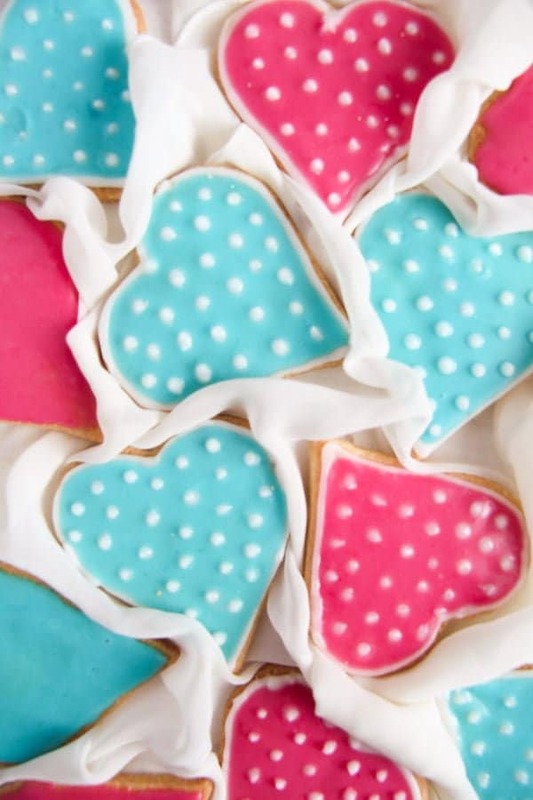 Color the sugar icing with pink and turquoise. Give each mixture into piping bags. Decorate the cookies. First outline each cookie with some of the stiffer white icing. Let this icing set for about 5 minutes. Pipe some of the colored icing onto the cookie, enough to cover the surface. Use a toothpick to properly spread the icing evenly inside the white icing frame. 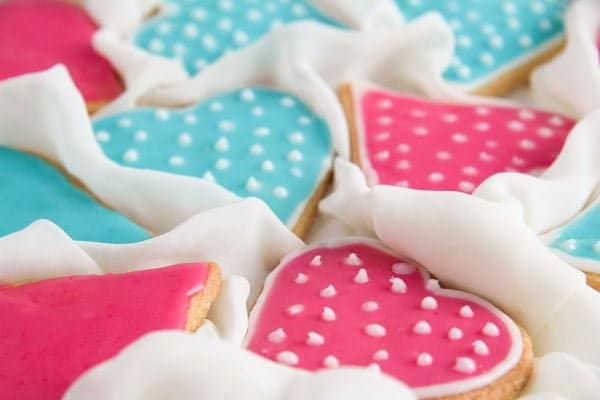 You will find that annoying while you make the first one or two cookies, but it will get easier and much quicker by the time you get to the third cookie, so don't panic. Place the cookies on the working surface in the order you flooded them. After flooding about 4-5 cookies or so, you can start making the dots on the first cookie you've flooded. The flooding should be just a little bit set at this point, but still wet enough to allow the dots to sink nicely into it. Pipe the dots with the white icing. Use a clean toothpick to smooth the dots, if necessary. Some of my dots had a bit of a comet tail pointing upwards, but I was able to easily fix that with the toothpick. Place the cookies on baking trays lined with baking paper and place them in the oven. Set the oven at its lowest setting and leave the cookies in the oven for about 20-30 minutes to allow the icing to set hard. This is my usual, fool-proof butter cookie recipe. A whole batch makes lots of cookies, between 40 and 60, depending on the size of the cutters. I did not want to make as many as that, that is why I halved the recipe and only used ½ an egg. For this purpose I beat the egg very well in a small cup and only gave half of the liquid egg to the dough. I plan to make some biscuits for Valentine’s Day, or I should say before that, so I can share the recipe. Yours look great.